​Meridian Farms, Century Downs and the ASHA welcomed the Olds and District Hospice Society to their “Let The Sun Shine” day. Let the Sun Shine is a charitable initiative to help charity and non profit groups with some much needed funding. At the 2018 ASHA Yearling Sale, Meridian Farms will donate the entire proceeds of the sale of one of the yearlings, “Two Tone Terror”, to five charities in Alberta. Throughout the year, these groups are invited to join us for a day at the races to give their group a chance to bring awareness to their cause. Joining us today the Olds and District Hospice Society. The volunteers at the society are dedicated to providing quality, compassionate care in a home like setting for those facing death by offering physical, psychological, emotional, spiritual and educational support to individuals, their families and community at the end of life and during bereavement. 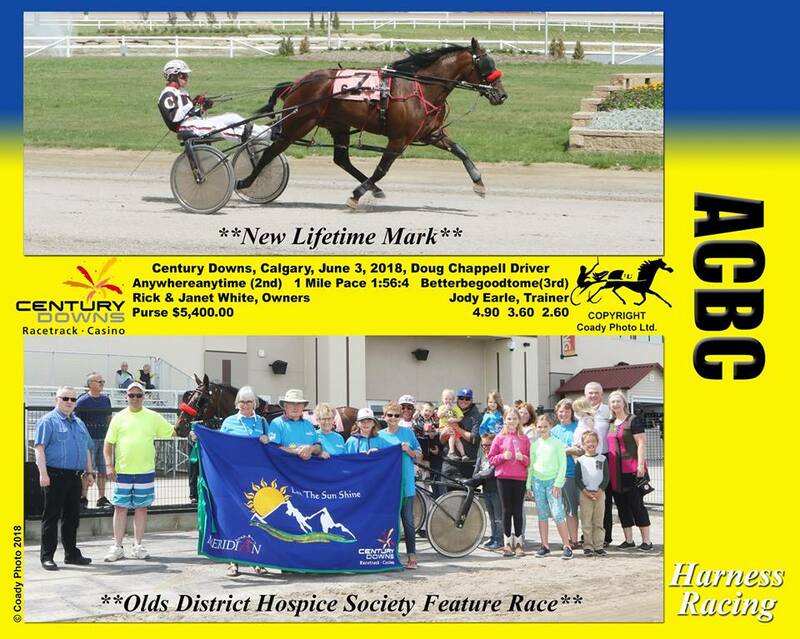 The Olds and District Hospice Society we would like to thank Bill Andrew of Meridian Farms, the ASHA, and Century Downs Racetrack and Casino, for their dedication and generosity to the community through the “Let The Sun Shine” program. They would also like to thank, the Hudon Family, the Haining Family, the Redwood Family and Brian Gray for taking time out of their busy mornings to let us experience the amazing horses and people on the backstretch. We are excited to see you at the 2018 ASHA Yearling Sale on September 9th at the Olds Regional Exhibition Mega Dome, when Meridian Farms will sell at auction, “Two Tone Terror” a bay filly by “Mystician” out of the “American Ideal” mare “Too Ideal”.